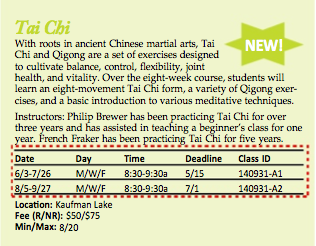 I’m going to teach a Tai Chi class for the Champaign Park District this summer. 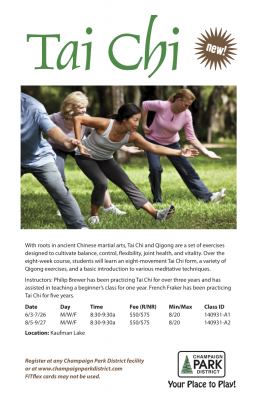 Screen grab of the Tai Chi course description. The park district doesn’t put their course descriptions on the web except in the form of the pdf file of the course catalog, which wouldn’t be so bad, except that they also don’t put the pdf file on their website, but instead offers it through Scribd—which makes it excruciatingly difficult to download the file. Otherwise, I’d go ahead and link to something. But, as I can’t find anything useful to link to, I’ll just paste in this screen grab from their on-line catalog. 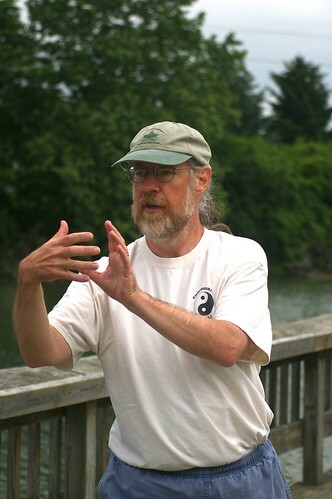 I’d encourage any local folks who are interested in an introduction to Tai Chi to sign up. It costs $50 for park district residents and $75 for non-residents. The first session runs from June 3rd through September 26th. The second session runs from August 5th through September 27th. I hate running on treadmills. I also dislike running outdoors in the cold. The result has been that, while I may get into pretty good shape in the summer, I always lose that fitness over the winter, because I don’t run. This year, I’m trying again to run on the treadmill. This year, I’m trying with podcasts. I don’t listen to my iPod when I run outdoors. Running outdoors is wonderful, and I want to experience it full. Running on a treadmill is awful, and I want to pretend it isn’t happening. I’ve had to make a second change to make this work: I’m going to the fitness center by myself. Before, I tried to fit my workouts into the joint visit to the fitness center that I make with Jackie to do our lifting. That didn’t work. Jackie was willing to walk on her treadmill while I ran on mine, but she wanted us to be walking together. Since I was trying to pretend that I had slipped into some sort of lacuna in the space-time continuum, I was an unsatisfactory companion. Jackie was also willing to carry on with her workout while I ran, but there’s no reasonable way for her to stretch her workout to last 20 minutes longer, which is only barely enough time for me to get a reasonable run in. So far, the scheme is working okay. For three weeks now, at least twice a week, we’ve gone to the fitness center for our lifting, then gone to taiji, after which I’ve gone back to the fitness center to run on the treadmill. The first couple of runs were kind of shaky, but I’d gotten them up over 2 miles last week, and today I ran 3 miles. That’s long enough, I think. My long runs outdoors had gotten up over 5 miles, but my plan for the winter isn’t to boost my endurance, it’s just to preserve it. If I can run 5–7 miles a week, I think I can accomplish that. A single 3-mile run each week, combined with one or two 2-mile runs, will do the trick. The podcast thing is working. My plan had been fiction, and I’ve listened to an Escape Pod story and to one on the Small Beer Press podcast. The problem with fiction is that it takes a while to get wrapped up in the story, and every instant that I’m not immersed in the story is an eternity of actually experiencing the fact that I’m running on a treadmill. Music works okay. News podcasts are okay, too. “At least they aren’t dark,” Jackie replied. They’re still well-lit. They’re still satanic. But they’re pretty tolerable, if you’ve got a story to listen to. I’ve been doing at least a little meditation pretty regularly for three years now, as my taiji instructor spends some time in each class meditating. I have yet to perceive any of the mental benefits that are supposed to flow from meditating. Perhaps I’m just doing it wrong. The physical benefits, on the other hand, have been remarkable. Before I started doing standing meditation, I’d gotten a little wary of excessive standing. I’d struggled a bit with plantar fasciitis, and had eventually come up with a multi-pronged approach that included a pair of slip-on birkenstocks that I used as slippers, supportive shoes in general, and limiting the amount of time I spent standing. Together, those tactics had served to keep the plantar fasciitis at bay, without quite curing it. In the past three years, since I started doing taiji, something has completely cured the plantar fasciitis. Maybe it was the taiji, rather than the standing. Maybe it was the running, walking, and other exercise I’ve gotten. I’ve lost some weight, and that’s bound to have helped. But I’m inclined to credit the standing with a good bit of it. I think this is true, even though I think I was also right to be careful about excessive standing, because standing meditation is not just standing. Standing meditation is standing with focus. Our instructor emphasizes that we’re not thinking about anything in particular, nor are we doing anything in particular (except standing), but we’re ready. We’re actively ready for whatever happens. Standing with this sort of intention is very different from standing while doing something else. While we’re standing, we making an explicit effort to identify and relax any muscles that we’re using beyond the minimum set needed to keep us upright. I doubt if a cashier who has to stand for an eight-hour shift would get similar benefits. Maybe I’ll eventually get some of the other supposed benefits of meditation. In the meantime, I’m happy to settle for just this one.